Q: What advice can you give on young bird training? The most important criteria for young bird training is that you start with a team of youngsters that are willingly exercising for one hour or more around the loft before you begin the road training process. If your young bird team does not fly willingly for an hour without being forced, and you attempt to train them anyhow, your losses will be heavy and your frustration level high. If you have some late hatches, you need to either have them in a separate section or catch them prior to releasing your working young bird team. When your team is ready to land, you then release your late hatches and in this way you will integrate them into your team without holding down the racing team. In order for youngsters to fly, they must be healthy. 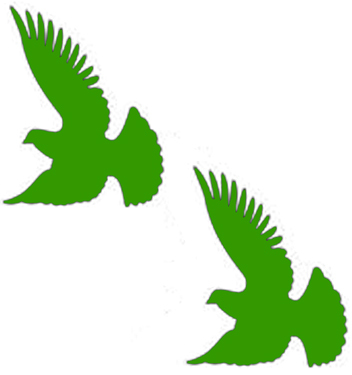 I always assume that a pigeon flyer will take care of such basics as coccidiosis or worms. A team of youngsters that does not want to exercise almost always has a respiratory or a canker problem. However, if only a few youngsters do not fly the way they should and are holding the rest of the team down, you must take them out of your team. Canker seems to be as much or more of a problem than respiratory. Birds that have canker will show very similar symptoms to those with a respiratory problem -- in other words, not flying, panting, and sometimes a discoloration of the edges of their wattles. Another comment about canker -- it is not necessarily visible in the throat or in the naval area like us old-timers were used to years ago. However, canker often lodges in the organs such as the liver. It even has been found in the brain of birds. So you see, many fanciers that have treated for canker think that their birds are clean and yet will go on struggling the entire season with heavy losses. The indiscriminate weekly use of canker medications has brought the fancy to the point that some of the common drugs do not work anymore. In other words, the canker strains have adapted to our drugs. Ridzol, which for a long time was the drug of choice, is the drug that now seems to be the least effective. The overuse of Ridzol as advocated by a number of medication programs that require using this drug one or 2 days a week every week has done us in. If you still have Ridzol available, the effective dosage now is 4 tsp. per gallon instead of the one tsp. per gallon that we were using for years. So it is best to revert back to Emtryl for canker if possible, or a better alternative drug, Flagyl. I believe Dave Marx may have discussed this in his health column on the AU web site. The other major problem, as I mentioned, are the different forms of respiratory problems. Again, this must be under control before your birds will fly readily and are ready for training. If your birds are flying an hour, leave well enough alone and do not use these respiratory medications. They will be that much more effective when you have a problem and you have to use them. Now as to the training of a good working young bird team -- I personally like to turn them loose at the crack of dawn and let them fly their hour or so around the loft. Then when I call them in, I basket them and take them for a 5 mile toss. Letting the birds exercise before a short toss is necessary to get a true reading on the birds. They have to be exercised first to take the "play" out of them -- otherwise they will not head straight home from the short tosses and you will have no idea if they are working properly or not. At the release site, it is important that you set the baskets on the ground. The birds will be scrambling and fighting in the baskets. Then there will be a total quietness where all the birds seem to be almost in a trance and are very quiet. After several minutes, the birds will start to scuffle around and move in the baskets again. You are now ready to release them. I like to release the birds one basket at a time for the first few tosses. If they go straight home without any delay, you are ready to go to the 10 mile point the next day. You need to go 10 miles for the next 2 or 3 training tosses. If they take off nicely and go straight home, then go to 30 miles. Once we are at 30 miles, we make several changes to the system. First, the birds are not flown at the loft before they are basketed. And second, I release the birds one half basket at a time -- a basket of birds at my loft holds 15 birds. My birds are always trained by themselves, never with other birds. I am not looking to have them be taken off course or for them to learn how to break. Instead, they go home about 7 at a time and hopefully in a straight line with no interference. I want birds that lead the flock on race day, not birds that are following someone else. It is always nice to see birds that are trained this way to bring other confused birds home with them on race day. When the birds arrive home at the loft after a training toss, they all receive the same grain of feed. In my case, most of the time this means straight corn. If you were to put a mixture of grain out for them to welcome them home, the early arrivals would almost certainly eat the safflower and corn. The birds that were released later, or even worse yet, the birds that came home late from training, would be condemned to eat peas. If a bird is hurting, this will set him back that much more. May I insert one comment on feed -- so often fanciers tell me that they feed the best feed available. The problem is, what people consider the best feed is a feed that is high priced. In pigeon feed, a high price means a lot of peas, or protein. Here again, you are overloading their systems and those maturing youngsters are doomed. I do not train beyond 30 or 40 miles for the entire racing season. In other words, I believe in frequent short tosses. I like to see the birds on the wing about 40 to 45 minutes. I am interested in training them mentally as well as physically, where they enjoy racing home. I am not interested in beating the birds up and making them drag in hurt and tired from training tosses. The 30 to 40 mile distance is also a matter of the wind -- if the birds have a headwind they go to the 30 mile spot, otherwise they go to 40 miles. If the birds do not arrive home in about 45 minutes, then again you must check their health. A healthy happy pigeon should be in a hurry to get home. One other point -- you will find that birds trained like this can be shipped directly to a 200 or 300 mile race. In other words, they do not learn the race route by having to go to a 100, 150, etc. Have them healthy and fit and they will be very competitive.